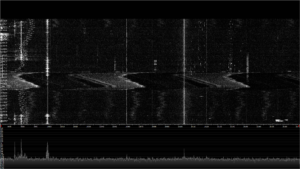 This is Part One of a multi part article dealing with setting up a SDR as a RFI site survey tool to assist in RFI detection, location, and mitigation. Further, part one will set the stage for how captures of the RFI were accomplished, and visualized. Part one will also touch upon some of what can be seen and learned from this data. Methods I used to locate RFI can be found here. Also some RFI sources signatures have been captured here. 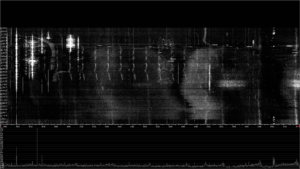 Part two will deal with interpretation of the SDR spectrogram. Part two can be found here. Part three will deal with actual location methods, using that portable SDR tool. You locate one source, get it fixed, and within a few months a new one appears. Unlike Whac-A-Mole, more than one RFI source can rear it’s ugly head at a time. If you leave things alone too long, the RFI sources just keep popping up until you have no spectrum left. As a free service, I do RFI locates for a lot of the locals in the Amateur Radio community via our local club. I must admit to an ulterior motive for this– it gives me a lot of experience in tracking down RFI. As part of a difficult RFI locate, I will do a simple site survey prior to any serious on the ground direction finding. This helps define start/stop times, frequency, and the nature of the RFI prior to looking. That data helps in the location process. It further gives me a feel for the area’s RFI environment. Having a feel for an area speeds the search process up considerably. I consider the survey a very critical part of any difficult RFI hunting I do. It also serves to document the nature and severity of the RFI problem, should things take a legal, (make that contact with the ARRL or FCC), turn later. It provides documented proof of RFI issues, times, severity, etc. My normal protocol has been to start S-Meter Lite, and Spectrum Lab, (see how to use these tools here), and run them both for at least twenty four hours, and preferably forty eight hours. I am looking for start/stop times, signal levels, number of sources, and pretty much anything else that will help me ID RFI sources, using the receiver and antenna being affected. This survey also gives me a somewhat restricted feel for what the RFI environment is like at any particular site, on one single frequency, across the audio passband of that receiver. Figure 2: RFI for 09/25/12 for 40 Meters. Figure 2 shows an S-Meter lite graph of S-Meter values across twenty four hours of time. By selecting the time frame, twenty four hours, I was able to document start/stop times of RFI across a day. This admittedly crude method of site survey would give me a quick and dirty overview of the RFI at a single frequency, and across only the audio bandpass of the radio being used. Given most of the RFI I is see created by SMPS, (Switching Mode Power Supplies), and that these evil little devices spray RFI everywhere, all at once, and across Megahertz of spectrum. I needed a better way to visualize the signal strength of RFI, than on a single frequency so I started using Spectrum Lab for this, because it would let me see the entire receiver passband at once. Figure 3: Twenty Four hours of RFI. In Figure 3, on the left, you will see the resultant FFT Spectrum Lab can generate once set up properly. This FFT represents the audio passband frequency of my receiver, along the horizontal axis, (starting low on the left, and moving higher in audio as you look right), time along the long axis, and signal intensity along the vertical axis. A little better, in that I am now seeing maybe 2 KHz of bandwidth. This FFT can tell you a lot about your RFI across time. 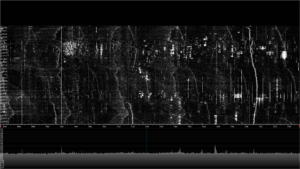 For instance, you can see the start/end times of the RFI source, you can see the relative strength of the source as detected, and you can see just how much of the audio passband is trashed as a result of the RFI. If I combine this data with S-Meter Lite, I can get the exact on and off times of an RFI source, and a feel for how bad the source is at one frequency. It also serves to document just how bad the operator suffering the RFI is being harmed by the RFI. This sort of additional data can come in useful when trying to prove harmful interference. Both of the above methods have inherent flaws, S-Meter Lite only looked at one frequency, (the frequency your test radio is tuned to), while Spectrum Lab, only looked at the demodulated audio from that radio, across the entire passband at once. I needed a way to better visualize an RFI environment as a whole, in both the frequency domain, and the time domain, across a wider area of spectrum than just the two KHz., Spectrum Lab provided. What I needed was to view the RFI in the RF domain, not in the demodulated audio domain. Why wide swaths of spectrum, and not single frequencies? Knowing that almost all SMPS generate RFI repetitively across large portions of the RF spectrum, I suspected I was missing most of the RFI using my current protocols for performing a site survey. I also knew that some of the RFI I was seeing on the bottom of Forty Meters, was also connected to the RFI I was seeing on the top of Forty, or worse yet, on the Thirty meter Amateur band as well. I really needed a way to see just how correlated the whole RFI experience was at a given location, across an entire Amateur band, or two bands at once, over long time-frames, at once. I set about constructing a system capable of displaying this sort of information about an area. 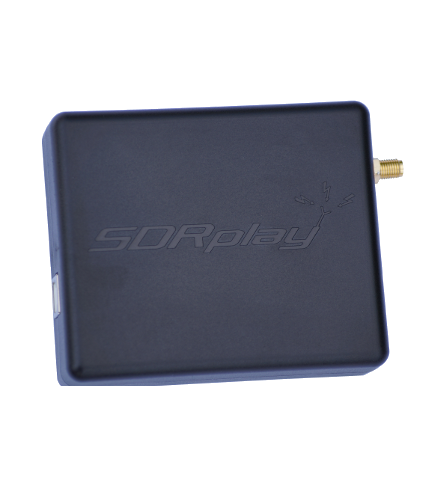 The thought of using a SDR to visualize large portions of spectrum immediately came to mind. My thinking was that with this approach I would be able to uniquely visualize related RFI sources in a way that was easy to see, in the RF realm, and across the wide expanses of frequency I wanted. 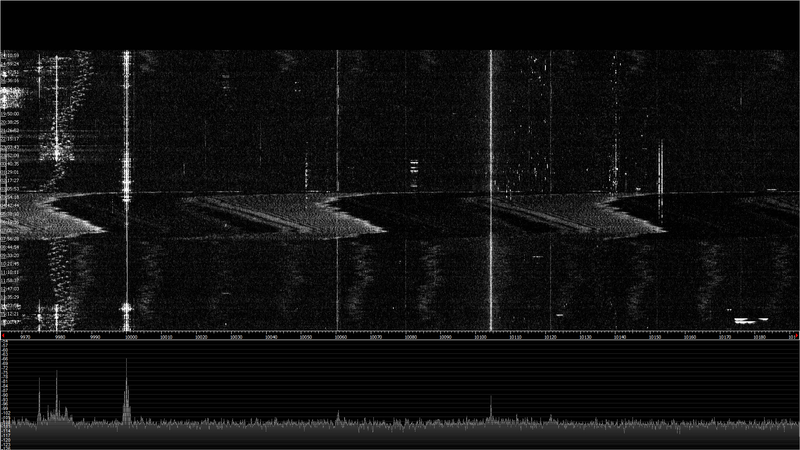 I purchased an SDRPlay RSP-1 as the radio, primarily because it allowed a wider sections of spectrum to be displayed. 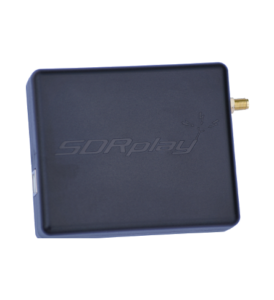 As a further benefit, the SDRPlay had more resolution than the standard USB dongle SDR dongle. A dongle would work for this project, but I also wanted better resolution, and wider frequency coverage. The cost of this little radio is nothing compared to what it does… It feels like a really decent radio, as long as you are not overdriving it RF wise. I then located a piece of control software, (HDSDR), which allowed me to take a sample every 1920 seconds, and display it in black and white. I feel a black and white image shows more detail than a color image does, and I wanted something close to a full screen image of the RFI environment, so I arbitrarily selected 1920 as my standard sized image capture time. This allowed me to take data over a twenty four hour period and visualize it as a single full screen image, showing an entire twenty four hour day at once, across an entire amateur band, in the RF realm. Figure 4, proof of concept image. I now had my basic setup in mind for a site survey tool. 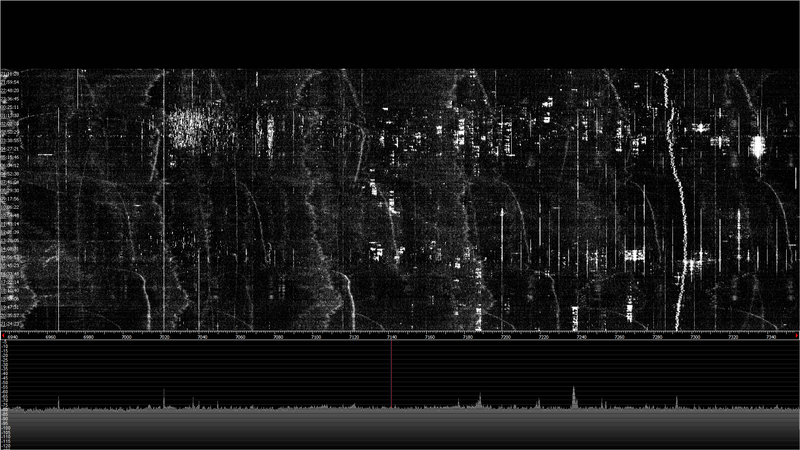 I next ran HDSDR for twenty four hours, generating the proof of concept spectrogram you see on the left in figure four. You can click the image to see a larger version, and I would recommend you do so. If you do enlarge the image, you will be rewarded with a mass of data, showing correlated RFI signals everywhere, across megahertz of spectrum, and over very long time periods. The design criteria of getting a feel for RFI over time, and frequency was met, I saw far more than I expected using this method. Look carefully for the hooked traces, then look to the right or left, somewhere around 50 to 100 KHz., you will see an identical trace, the levels may be different, but the pattern generated is an exact match, this means that the constellation of traces which are all matching, are coming from a single device. One of the first things I learned was that most of my RFI is coming from far fewer devices than I suspected. I wanted a wideband antenna, so I used a B&W, BWD-90. This antenna is a ninety foot long TTFD, at an average of 20 feet above ground as the main antenna. This antenna is reasonably flat in response from 2 MHz., to 30 MHz., so a two Megahertz spread does not suffer from too much roll off in sensitivity, as my vertical would. This alleviates most sloop issues if I keep the bandwidth down. This further gives me a standard antenna to use in all tests, that hopefully works the same or close to the same at all frequencies. It turns out it is not as flat across very large sections of spectrum as I might want, so I ended up doing a calibration run for each ham band to at least try and keep things on an apples to apples basis. Figure 5: Twenty Four Hours of 30 Meter RFI. I ran HDSDR on 30 Meters for a twenty four hour period, using the GAP Challenger antenna in my back yard, in order to get a long term visualization of of the RFI across the entire Thirty meter band at one time. The resultant image is on the left, shown as figure 5. Almost instantly the usefulness of this new method became apparent. 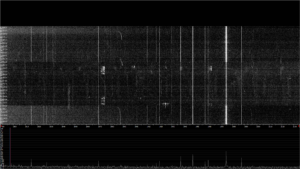 I note what looks like a single source of RFI that tends to wander all over the band, frequency wise, as shown by the twin white lines drifting around in frequency and in tandem with each other. This clearly shows that the major RFI source in 30 Meters is really a single item, that is saturating the area with RFI that bounces all over. This sort of observation is good for an overall survey, and it gave me new information. It also helped me visualize what the RFI on 30 meters in my area looks like. 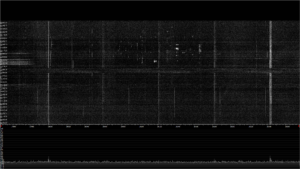 So, the proof of concept image led me to this image of Thirty meters, you see on the left as figure 5, which instantly showed me new information, (lots of RFI from one source), all of which provides a real overview of the entire RFI environment at my location. I next set about to do a full survey of my home QTH, on all bands. As part of the proof of concept image runs, I had learned that I needed to run calibrations to set the base noise levels as measured on my Elecraft K3, to the same levels shown on the SDR. 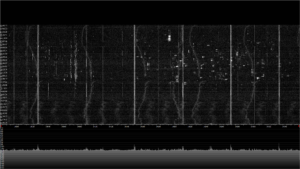 I set about taking a twenty four hour survey of every ham band from my home QTH, and generating a spectrogram of the data. Starting with 160, and moving to 6 Meters. The survey consists of several images, each representing a twenty four hour period of time, across one ham band, with a little extra. 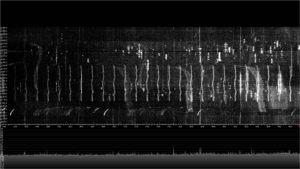 Starting with 160 Meters, and moving towards 6 meters, will take a bit of time– but I am adding spectrograms as I take them. At the end of the survey is a broader scope image, showing 1.7, through 11.7 MHz., this covers 160, 80, 40, and the 30 meter ham bands, will be taken just to tie in the very wide RFI sources, showing them moving between Amateur bands. I also began showing the signal strength info which is below the waterfall to show some relative signal strengths vs brightness on the graphs. This allowed me to get and keep a feel for just how strong a signal was by the intensity of the white on the screen. 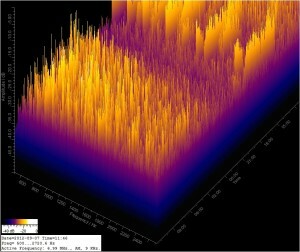 I then set about displaying one twenty four hour period for every band as I see them from my home, using the BWD-90 TTFD antenna. This served as a way to get me familiar with the process, and to develop some standards for taking a spectrograph. It also documents my RFI in a fully repeatable way. I am fortunate in that a grower in the area is moving in a few months, so I will be able to see what changes happen when he does. He lives maybe five blocks from me. I located him using a magnetic loop and my FT-817ND. He indicated he was moving, so I will wait to see the moving trucks, then take another survey across all Amateur bands. Below are the results of that effort. 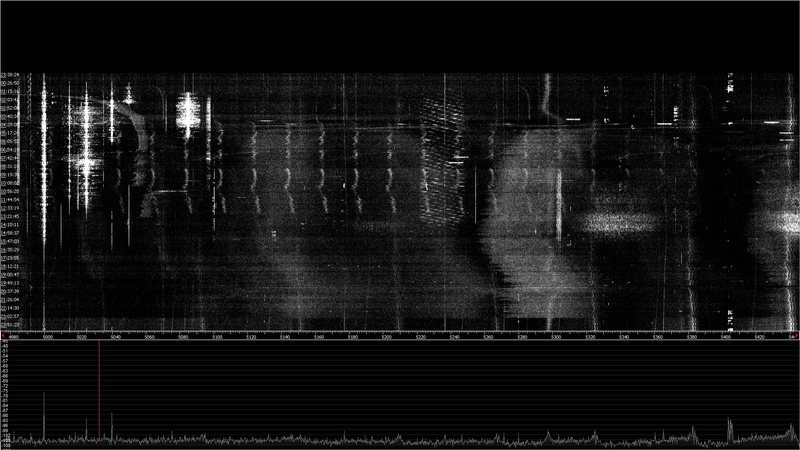 I will be adding each band as I take the spectrogram of it. As I build experience, I will refine and document the process for part II. This image is a capture of twenty four hours, starting at local morning. All times are in UTC. You can see some interference from the local AM station, as they switch from day to night power. 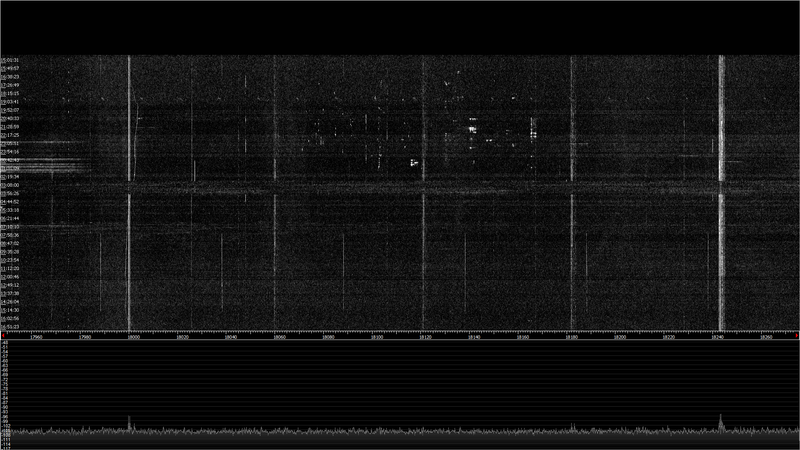 I suspect this is some image of the local 50KW station, that is three miles from me, that the SDR is showing erroneously. The lack of RFI here, is probably due to my poor antenna performance on 160, not a clean environment. This image was started on 09/05/16 at around 3 PM local time. All times shown are in UTC. Note the night time openings and activity around the JT frequencies. 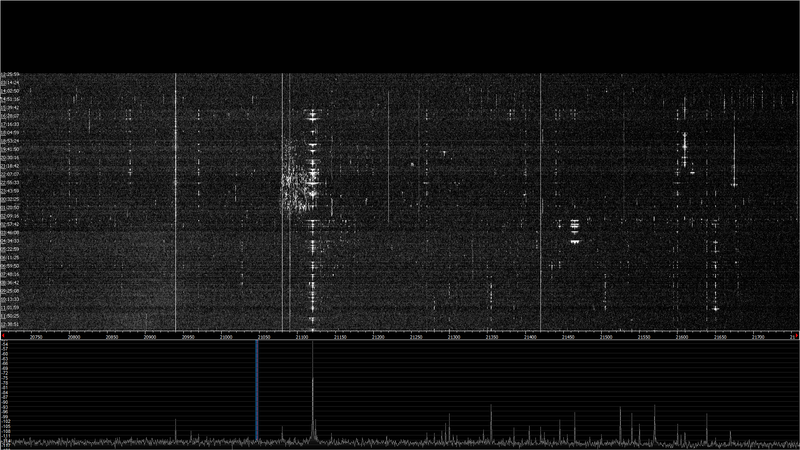 Various RFI sources can be seen starting, stopping, and drifting around in frequency, across the entire timeframe. It appears that there are only three or four sources at play here. As can be seen this method of visualization of RFI begins to show just how powerful it really is. 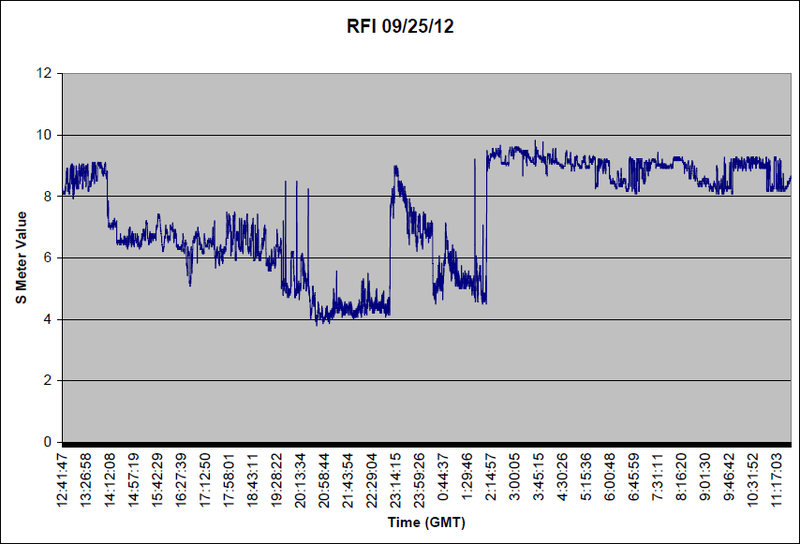 I can instantly see that a single source is causing a lot of RFI across the entire 80 meter band. The 5 MHz., WWV signal is shown on the left to indicate actual conditions. Calibration run was performed, so all of the values you see here are actual. It looks like three possibly four sources are involved in all the RFI being shown. You can see the Short Wave stations to the right of WWV. This image was started on 09/02/16, at around 3 PM local time. All times shown are in UTC. 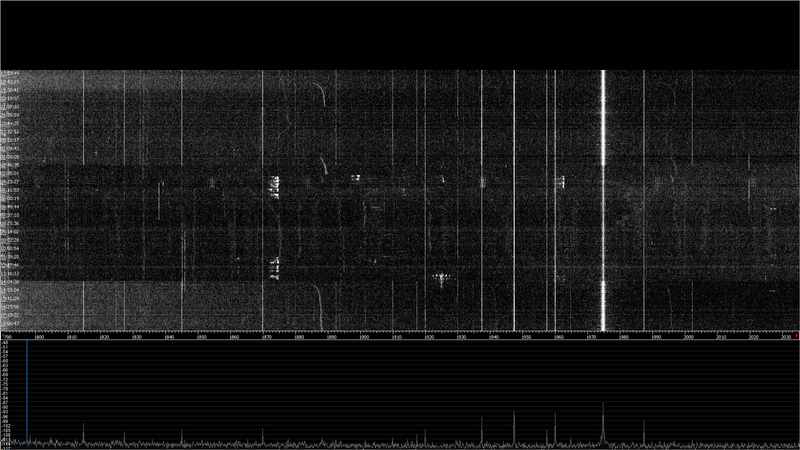 Frequency is across the bottom, time runs vertically, and intensity indicates how strong the signal was. As can be seen, much of the RFI on forty comes from only a few sources, but they are rich in harmonics. Note the CW activity across most of the night on 40. Greyline propagation can be seen in the morning starting around 1330. Twenty four hours of RFI on 30 Meters. This is by far the most informative capture so far. Note almost all the RFI that can be seen is caused by one source, which looks surprisingly like a horticultural light starting up, then drifting, and widening during the startup phase, then finally settling down to almost no RFI. Note it takes it a long time to stable down. Also note WWV at 10 MHz, sitting at around S9 plus 5 db. Looking at 20 meters, you can see 5 vertical lines. I believe all of these are ethernet carriers, they have the look of an ethernet device. 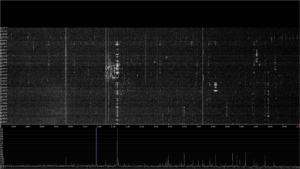 There are a number of repetitive RFI events across the entire 20 meter band. I am now able to see most of my 20 meter RFI is caused by two, or possibly three sources. Overall my 20 Meter RFI is not really an issue. Most of it is below S5 in level. As you can see, very little is here on 17 meters… I am pretty sure the trace at 18.240 MHz., is an ethernet carrier constellation. Beyond that, almost nothing RFI wise here… I thought the antenna might be at fault here, but actual signals can be seen, so the antenna is working. 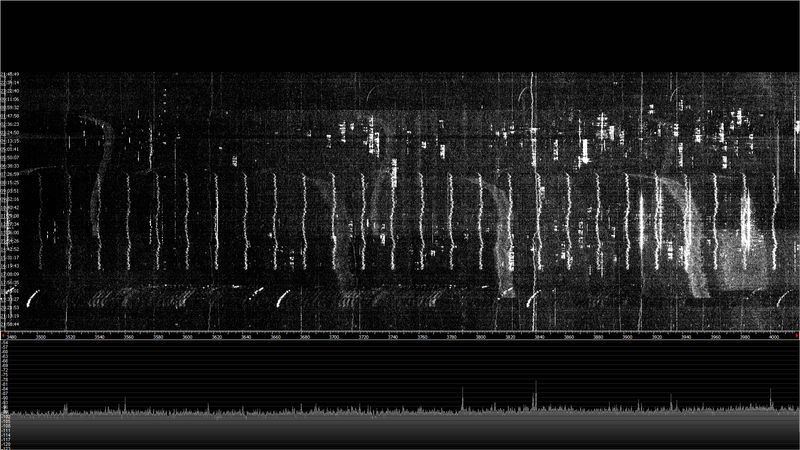 This spectrogram was taken on 09/24/16, on 15 meters, during the CQ WW RTTY contest. I wanted a bit of activity to show a contrast to any RFI seen. 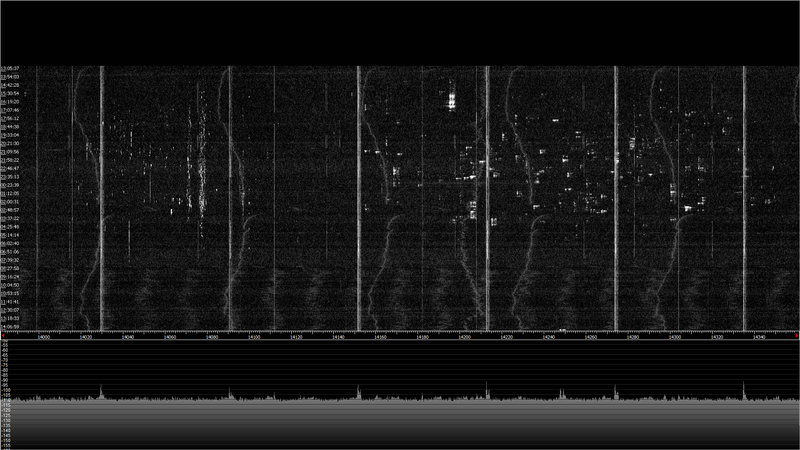 I am unsure if all the spatterings are RFI, or images from the SDR. I will be looking further into this and add the results as an addendum here once I get an answer. Starting at around 1717 UTC you can see the RTTY stations as hundreds of little dots. The total band open time is from 1717 to 0120 UTC. Click here for Part II, interpertation of your RFI environment.